Sam and Duncan's second adventure in hops saw them plunder the US. They opted for three varieties with plenty of punch too: Simcoe, Amarilla and Mosaic, and didn't hold back on the malt base either, layering on plenty of toasted and biscuity malts to not only give the beer its blood orange hue but enough of a backbone to keep the hops in balance. 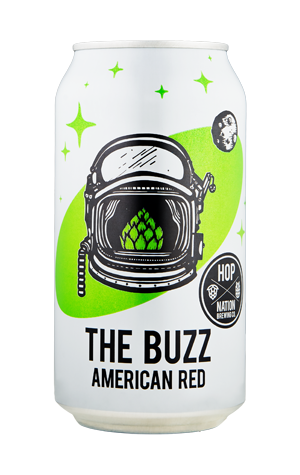 The beer comes with a nod to Buzz Aldrin in the shape of a hop-filled astronaut's helmet on the label. And it was also the beer from Hop Nation's opening trio that this site's founder chose to represent them in the Great Australian Beer Guide.